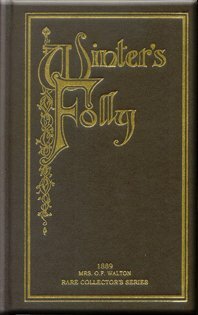 Winter's Folly is part of the Fireside Collection and the Walton Collection. This is the tender story of lonely Old Man Winter, who demonstrates the epitome of selfless love. But all is not lost as young Myrtle, through her childlike innocence, rekindles his desire to live. This true-to-life story reminds us once again that when life seems to hold more than we can bear, we can rest assured that we have a loving God who is orchestrating events for our good. From David Hernandez of San Bernardino, California on 1/22/2018 . This is an excellent Heart Warming book of unknown fears/love, giving and of prayer - love this book, I have two copies so I can share.